At Mills Teacher Scholars, we know that collaborative inquiry builds teachers’ local knowledge about how best to support their students’ learning. By sharing that knowledge publicly, they develop a collective understanding of where their students are and a vision for where to focus their energy going forward. To close the year, our teacher scholars are taking stock of what they’ve learned and sharing it with their colleagues in presentations and posters, while discussing the broader implications for teaching and learning in their districts and schools. 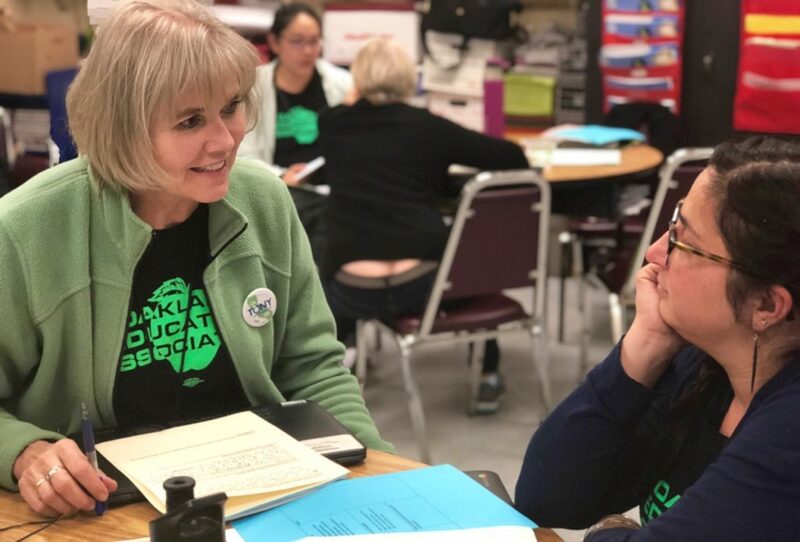 Get a glimpse of how our teacher scholars are leveraging their learning beyond the walls of their classrooms in the photos below. 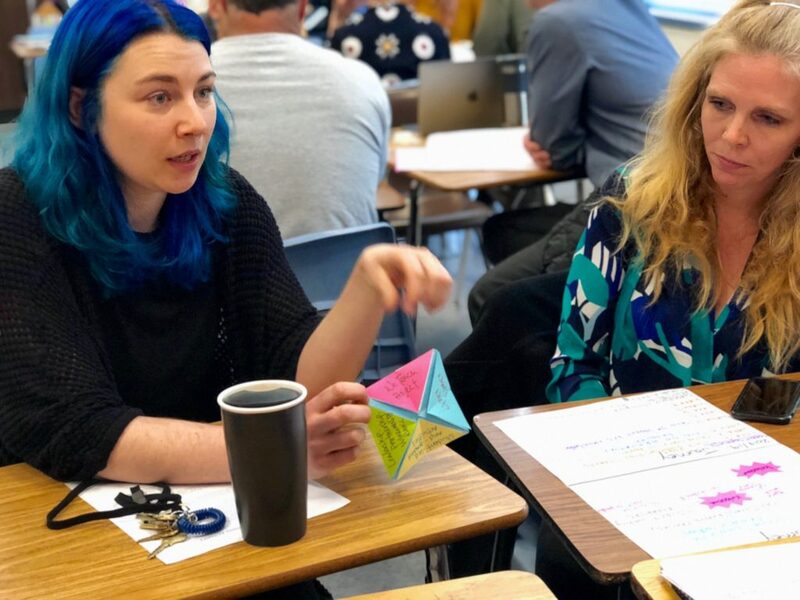 Oakland Technical High teacher scholar Portia Carryer shares the story of her inquiry journey to three colleagues on her ninth grade team, including Amy Talley (right), with a folded poster. 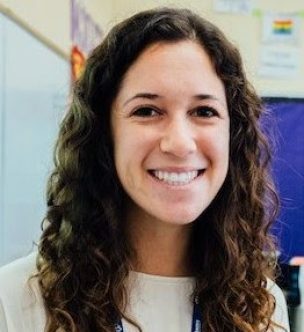 On the flaps she has written themes like “vulnerability” and “respect” that represent the values at the center of her inquiry and the goals she has for her students’ learning. As she unfolds the tabs, she reveals the layers of her learning—the questions, the findings, and the practices that align to those values. In discussing this year’s learning, the Oakland Tech team decided that next year they will focus together on key areas of improving their practice including improving group-work and increasing student voice. After sharing the results of their individual inquiry learning, teacher scholars in our Social and Emotional Learning group had a chance to reflect on the work they did leading inquiry at their individual school sites. 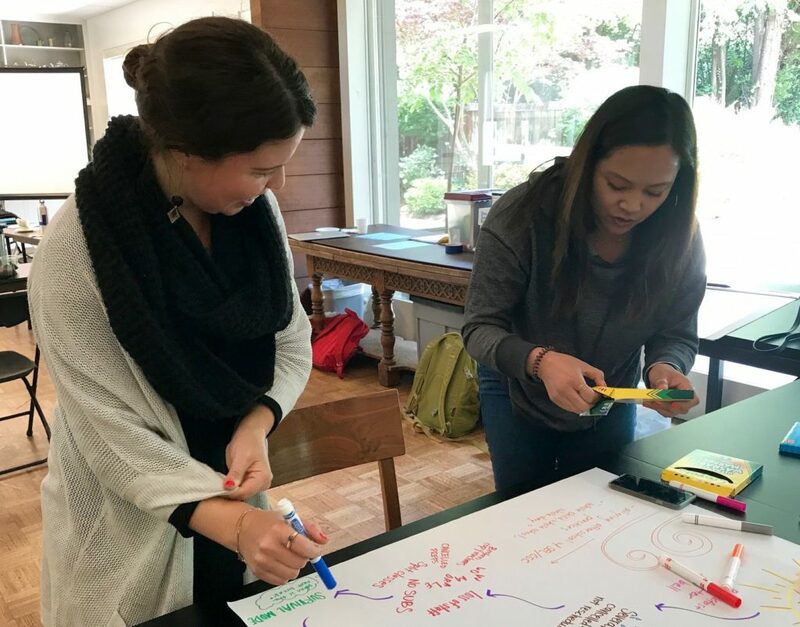 Here, Garfield Elementary teachers Ruanna Owens and Malia Tayabas-Kim create a journey map of their work supporting their colleagues’ learning around how to integrate Social Emotional Learning and academic content. 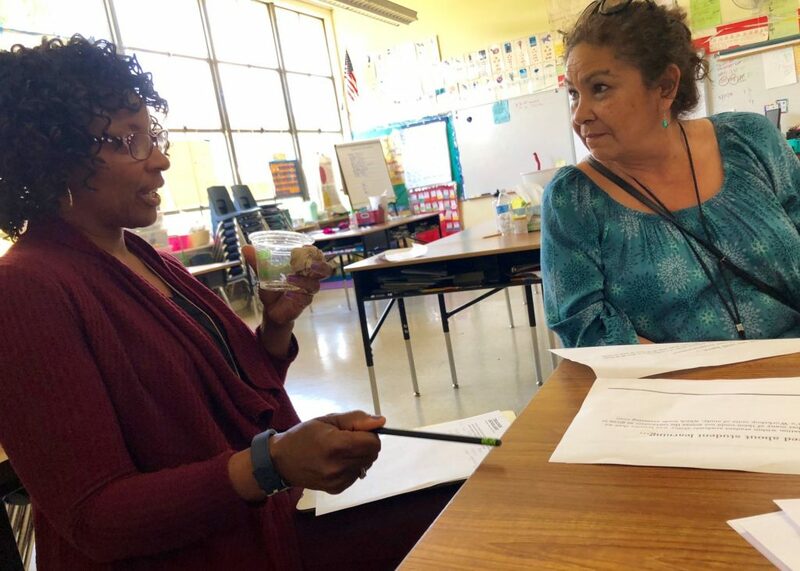 Lorenzo Manor teacher scholars Tonie Mitchell and Celia Montes discuss the common patterns and themes that emerged in their inquiries into effective implementation of Lucy Calkins Writing Workshop. Their Sharing group – comprised of one Kindergarten teacher, one 2nd grade teacher, one third grade teacher and one Special Day Class teacher – reflected on the benefits to both students and teachers of consistency in learning expectations and instructional vocabulary across the grade levels. Computer Science teacher scholar Chantel Parnell shares her inquiry learning with a group of other Computer Science teachers from across Oakland Unified, including Alia Ghabra (right). One theme of Chantel’s inquiry, shared by all in the group, is an ongoing curiosity about how to support student mastery not only of technical products and skills, but also of the process of problem-solving and how to involve students in defining and evaluating their success. 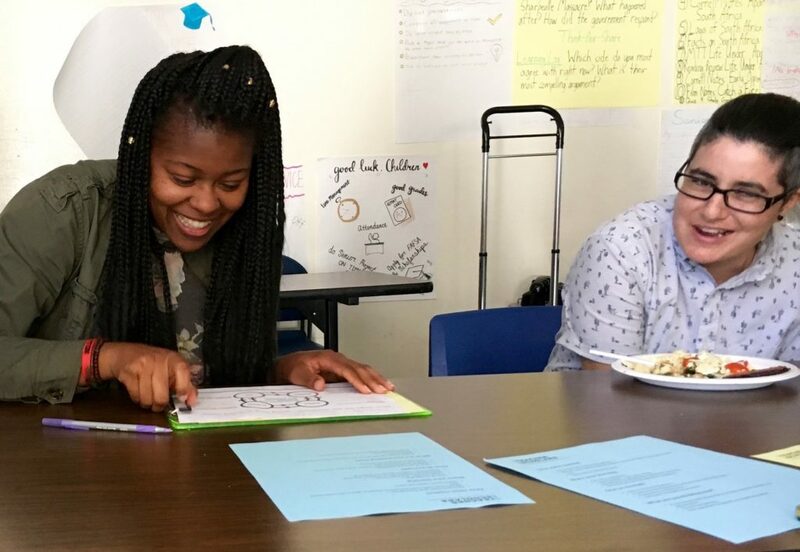 Teachers at Oakland Unified’s Life Academy shared their year-long inquiry work across grades and disciplines. 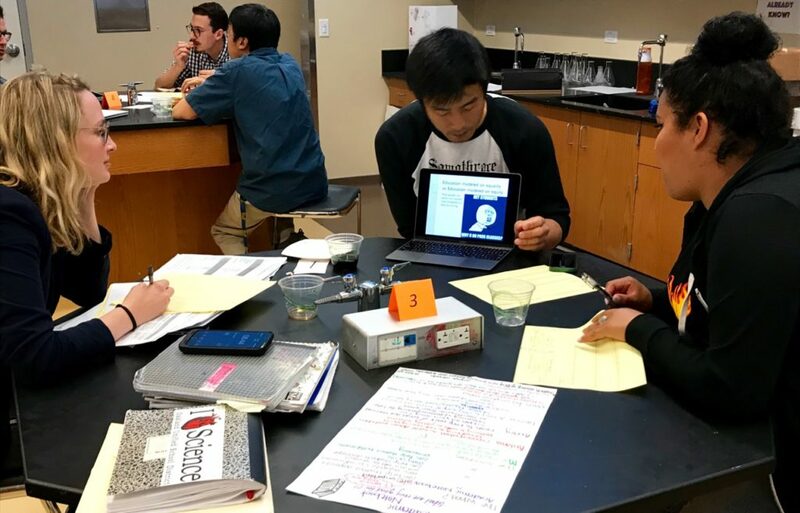 In this triad, science teacher Sarah Pipping, Humanities teacher Yuji Okamura, and math teacher Elena McDonald-Martyn share their realizations and ongoing questions. Kasondra Walsh, from Oakland Unified’s Emerson Elementary, shares about her inquiry into structuring effective small group instruction in reading for her kindergarten students. 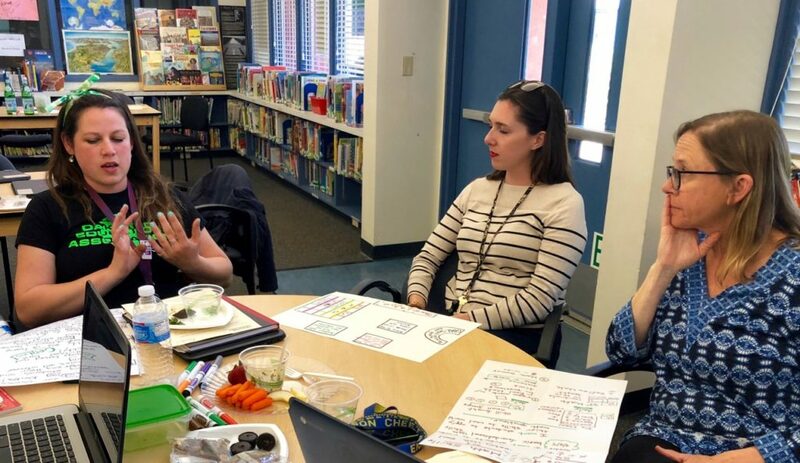 Through the inquiry work, Emerson teachers collectively gained an increased appreciation for and understanding of how to implement and manage small-group instruction across the school day. Gesine Cotteral of Oakland Unified’s Lincoln Elementary shares about her inquiry with colleague Carla Aiello. Collectively, the Lincoln team used the inquiry process to understand how to increase and improve academic talk in their classrooms. Gesine in particular focused on supporting her first graders to engage in more productive partner conversations.